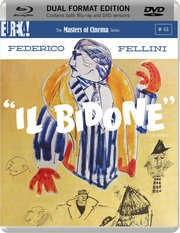 Masters of Cinema fans can rejoice once more as Eureka Entertainment announce the release of Il Bidone, the second of what has been dubbed Federico Fellini's Trilogy of Loneliness. Out on dual format DVD and Blu-ray this 30th December, it stars Broderick Crawford, Richard Basehart, Franco Fabrizi and Giuletta Masina. Also known as The Swindle, the comedy drama comes with a new high-definition restoration in its original 1.37:1 aspect ratio with a mono Italian soundtrack and English subtitles. Extras will include the original trailer and the obligatory 36 page booklet with words from Federico Fellini, rare imagery and more. The recommended retail price will be £19.99. This is an unsparing look at the dog-eat-dog values of post war Italian society that nonetheless manages to navigate expertly between the lightly comic and the emotionally stark to become one of his richest, most moving works. It follows three small-time conmen - the ageing Augusto, Picasso and Roberto, as they prey upon the poor and gullible for modest gains. However, once Augusto is unexpectedly reunited with his daughter, now struggling with her studies, the moral and emotional demands of his lifestyle begin to take their toll sooner than he had anticipated.